If you know me well, you know that I can’t last a long time without visiting the beach. My family and I love spending time soaking up the sun and feeling the sand in between our toes! Since the summer season is in full swing, I’m sure everyone is headed to the beach for some much-needed relaxation time. While this is wonderful, it must be said that even as we have fun under the sun, we should be mindful of the harm that increased sun exposure can cause us in the long term. Climate change is real; we are feeling temperatures rising each year along with extremes in weather patterns. Sunblock is a must for each member of the family, not just during the summer season, but any time you go out. Not all sunblocks are created equal though! It is incredibly important that we are informed and conscious consumers that don’t blindly buy whatever is on the shelf. There are many sunscreen brands available in the market, but some of them have chemicals that can harm your skin. Some chemical sunscreens have been known to be absorbed by your body and cause problems like infertility and allergies. This extends to other products that you may have with sunscreen properties, like BB creams, moisturizers, and multipurpose foundations. Moreover, sunscreen does come off and seep into the sea water. 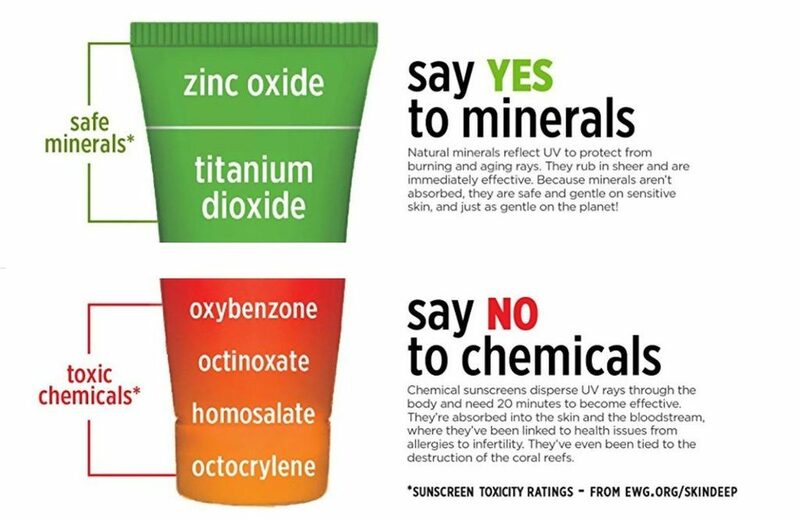 Some sunblocks have too harsh chemicals, that they poison coral reefs and degrade ocean life. That’s a double whammy! When choosing a sunscreen to use, first look for those made with zinc oxide and titanium dioxide, which are natural minerals. Most natural sunblocks will be composed of minerals and oils, which do not do any harm to you, nor to the planet. Looking for these products is not as hard as you think! I highly recommend I the Smooth and Poreless 100% Mineral Matte Screen (SPF 40) from Supergoop, as well as Face and Body sunscreens (SPF 45 and SPF 47) from Elta MD. The labels on these products clearly tell you how long the sunscreen will last, so you have an idea when you should reapply. For budget-friendly options, you can turn to the ever-reliable Human Nature. Their Safe Protect Sunblock is 100% natural at a price that does not break the bank! Alba Botanica Natural Emollient Sunscreen is another option great for bringing along to the beach. For an everyday option for use on your face, you can try Origins Mega-Defense Advanced Daily UV Defender SPF 45. Origins has some really good natural skincare, and may be a good option to try. I wanted to bring attention to this, because we have to be reminded that the earth is not just for us humans. There are many living beings who share our big, beautiful planet, and they are also affected by the choices we make as consumers. I hope you remember to keep this summer fun, not just for yourself, but for our oceans, too! 🙂 Where are you going for your vacation? Let me know in the comments below!